Shot charts are, simply, diagrams of the playing pitch with marks made detailing where shots were taken, and whether or not they resulted in scores. While perhaps limited by their simplicity, they can offer a great deal of insight into how a match was played by the two teams involved. In this article, we get into why they’re so useful as an analytical tool, as well as their limitations. Shot charts were created for five different national league games, all of which were in the knockout stages of the competition: Waterford vs Galway (Quarter final), Kilkenny vs Wexford (Quarter final), Tipperary vs Wexford (Semi final), Galway vs Limerick (Semi final) and Galway vs Tipperary (Final). Shots were divided by which team took the shot, and in which half of the match it was taken. A black dot indicates a miss, a white dot indicates a point and a green dots indicates a goal. Several challenges arose in creating the shot charts; the following lists some of these, as well as the reasoning behind the solutions we chose in dealing with them. First, the intent of the player. It can be surprisingly difficult at times to distinguish between whether a particular hit was a shot or a long pass. This can be further obscured in situations where the shot was blocked down by a defender marking the shot player, so that the shot’s unimpeded trajectory was never seen. There may also be situations where points, or even goals, result from plays intended to drop the ball into the full forwards. Despite these grey areas, black and white rules were required in order to make the charts consistent. Therefore, the following guidelines were made: A hit to the sliotar is considered a shot if it results in a wide, point, a goal, or hits the crossbar. It is considered a shot if it results in the opposing goalkeeper saving or catching it, even if it’s unclear whether or not it would have resulted in a score had the sliotar continued unimpeded. It is not considered a shot if it is blocked down by a player marking the player hitting the ball. It is not considered a shot if it’s caught by a defender (such as a long ball dropping in front of the gaol), but it is considered a shot if it’s deflected from the goals by a defender (i.e. If it’s an obvious save, regardless of whether or not it was the goalkeeper). There are, of course, arguments that could be made against these rules, but they were selected for consistency across different games. As a general rule, if you see a shot on the chart taken from a very unusual angle or distance, you can usually assume that it came from one of these outlier situations. Secondly, the location of where the shot was taken from. 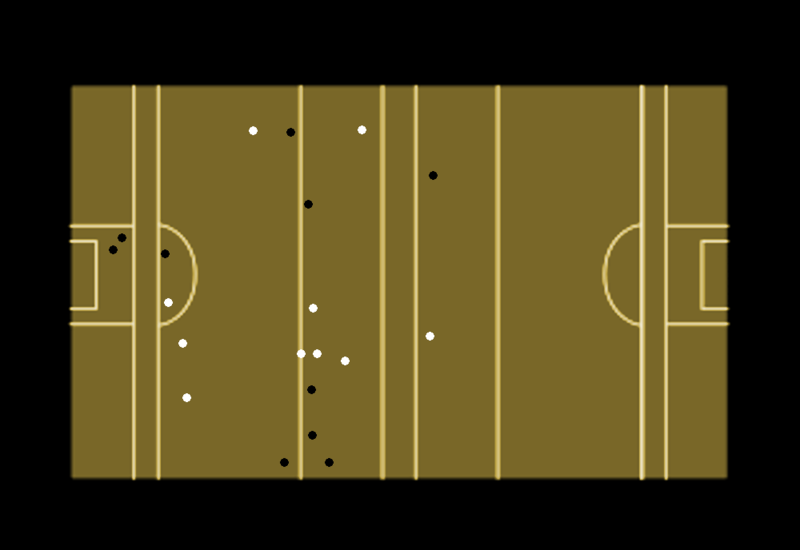 These charts were created by simply watching the TG4 broadcasts of all the matches, and making the best guess at where the player was on the pitch when he hit the ball. Without access to multiple camera angles on every shot, or any player tracking data, it’s inevitable that many of these will not be entirely precise. Due to the main camera angle for most shots, the distance from the goal is usually reasonably accurate, but how far left or right of centre may have more variance. Additionally, each pitch is different: while certain shots may appear to take place in the same location in different matches, it might be a trickier or easier shot depending on the dimensions of the specific grounds. Finally, there were several opportunities to gather more information about the shots, that were simply not taken due to time constraints. These include factors like who took the shot, who, if anybody, was marking them, and whether the shot came from play or a set piece. Should we revisit this topic in the future, these are all potential improvements which could be made to give greater context to the shots taken. With this out of the way, let’s take a look at what the shot charts can tell us about each game. Shot charts are detailed showing how each team did across the entire game, and through each half. Below the charts, the number of shots taken, and points per shot taken are listed (With goals, the maximum theoretical points per shot would be 3). In addition to all this factual, objective information, I’ve also provided my own interpretation and analysis of the match, based on the information given in the chart. Waterford led in this one at the half, and managed to increase their lead substantially in the early second half with two goals. The early game was theirs; they were taking more shots, and scoring at a higher rate than Galway. However, in the last fifteen minutes, two things changed for Galway: their defenders began dominating possession, preventing Waterford from getting many scoring opportunities, and Joe Canning began to score the difficult shots that Waterford were forcing Galway to take. This match displays two strong defensive teams, who forced their opponent to take shots from distance and from the edges of the pitch. Galway, however, simply did this much better in the second half, and, in what would become a trend for Galway, their outstanding ability to gain possession allowed them to come back and win this match. Despite Waterford's more efficient shooting, Galway's forwards had much more leeway, as they ended up taking 11 more shots in the second half. Kilkenny appeared to be their usual selves in the first half; they were getting their shots front and centre, rarely getting pushed too far back or towards the side of the pitch, and they were getting more of them too. However, there was one thing missing: They simply were not scoring from them, getting a below average 0.5 points per shot. Wexford, though they struggled to get their opportunities, made the most of them; when they had possession, they worked their way into good spots, and were clearly aiming to create goal opportunities, which paid off. This superior efficiency allowed them to stay level after the first half. In the second, the roles were flipped: Wexford were getting way more shots, taking 11 more than Kilkenny. Kilkenny seemed to fix their accuracy, and managed an excellent 9 points from 12 attempts, but without a big dropoff in Wexford's own shooting, it wasn't enough to counteract Wexford's massively improved possession holding. In the end, Wexford's patience in the first half, combined with their adjustments in the second, led to a solid win for them. On a sidenote, I'd also like to point out that this shot chart has my favourite weird outlier: A long ball from Wexford's keeper, intended to drop in to their forwards, instead dropped slightly further and went straight into the net. The result is a green dot well into Wexford's half of the pitch. This was a one sided game, and the shot chart attests to it. The first half showed Galway well in control, playing their style of hurling: they took more shots than Limerick, they scored at a higher rate, and when Limerick were able to take their shots, they were from worse locations. The appeared to attempt to work their shots up close, in an attempt to get goals. While this paid off, with a goal scored in the first half, it simply wasn't enough, as they sacrificed too many opportunities overall. In other words, they failed to take their points, and tried to force the goals to come. Galway, on the other hand, were perfectly happy too take their points from anywhere, and their high success rate, even when further away or at the edges of the pitch, indicates a loose, ineffective Limerick defence. In the second half, Limerick overcompensated for their first half weaknesses; seeing that Galway were too good at winning the ball, and seeing that they were trying too hard for goals, it looks like Limerick began taking any shot they could get, from all sorts of spots on the pitch. This resulted in the second-lowest points per shot of any half in any of the matches studied. Galway, however, appeared to adjust to the weaker Limerick defence, and began to take their shots from a narrower range of locations, clustered closer to the Limerick goal. This led them to even more efficient shooting, and finally allowing their goal to come. Tipperary showed in this match why they've been the team to beat over the last year: incredible scoring efficiency, created through a combination of sensible shooting locations and, of course, lots of goals. Wexford struggled a bit in the first half; though they had their share of possession, Tipperary's defenders were repeatedly able to force them into the edges of the pitch. Though they were able to successfully take their shots, rather than turning the ball over, these difficult shooting locations resulted in a very low scoring percentage. However, by maintaining possession, they were still kept in the game. On the other end, Tipperary took quality over quantity, taking fewer shots, but getting goals out of two of them. The second half was where Tipperary really went up a gear. Tipperary continued to get into great locations for shots, but in much greater volume. Three more goals meant that Tipperary actually came close to getting more points than shots; had they scored even one more of their wides, it would have tipped them beyond the 1:1 ratio. Wexford were blown out of the water, and interestingly were only able to manage the exact same result as in their last outing to Nowlan park: a second half with 14 points generated from 23 shots. While certainly a solid performance offensively, it was far from sufficient given the circumstances. This was a result that few saw coming, but Galway provided us with all the signs early on: they reached this stage through great defence, controlling possession and shooting in volume, and in the final they perfected it. In the five matches studied, no team took more shots in a match than Galway did here, no team took fewer shots in a match than Tipperary did here (Limerick also took as many, also playing against Galway) and no team had a less efficient half of shooting than Tipperary did here. Galway bullied Tipperary, especially in the first half, resulting in a massive difference in shots taken. On the other end, Galway opted to take any shot they could get rather than risk turning the ball over. Their accuracy suffered from this in the first half, but the sheer difference in opportunities, combined with their defence's ability to hold Tipperary to an even lower shooting efficiency, rendered this a non-factor. Though Tipperary's scoring normalised somewhat in the second half, with them better able to get to good locations when they were able to maintain possession, Galway only got more accurate, going where they wanted on the pitch and scoring three goals as a result. Controlling possession is the foundation of Galway's game, and is what put them in the lead following the first half, but when their forwards began to make their shots in the second, Galway simply ran away with this league final. In the same game, Galway demonstrated how a match can be won by either taking more shots, or by taking better ones, and in each case the key was maintaining possession and avoiding turnovers. The above analyses show just how much you can discover about a match from shot charts. It can be a habit for pundits to focus too much in what happened in the last fifteen minutes of a game, or even on just the final result, but shot charts can more fully document and remind us of the entirety of the match, and the various scoring swings that can occur within it. Their lack of context can sometimes help them to add clarity: Often, the popular narrative of a match can distract from other, more subtle trends which slowly tipped the game in the favour of one team over another. It can often be just as important to look at where there weren’t shots as where there were, as this can show us whether or not the defenders managed to control the forwards’ positioning. For an example of how shot charts can contradict the obvious conclusions about a game, it could be noted that one team got many more wides than their opponents, and therefore aren’t to be taken too seriously. However, looking at the shot chart, we can see that they also had many more shots overall, indicating that they dominated possession. The opposite can also be true: perhaps they scored a high percentage of their shots, but they failed to get many shooting opportunities. This could indicate a team struggling with possession or them facing a very physical team, leading to most of their shots coming from frees. In another example, a team could also lose by a large amount, but looking at the shot chart we see that they actually forced their opposition to the margins of the pitch, but their opponents got lucky or had exceptional shooters. Shot charts can greatly help in revealing how much more nuance there can be to a match beyond the final score, and making these subtle events more clear. However, just as the shot chart’s simplicity can benefit it, it can also be a major drawback. It was mentioned above that the shot chart fails to account for whether or not the shot taker was closely marked: There are several shots that look like bad misses, but when the footage is reviewed we can see that the shooter was forced into taking the shot while running backwards, or while tightly marked by a defender. Similarly, there are shots that look difficult, but when reviewed we discover that the shooter was given an unusual amount of time and space to take the shot. Another issue is that, without reviewing the game and how these shots happen, it’s easy to look for trends that aren’t there. The human brain is remarkably good at finding patterns, but is also very capable of finding them where they don’t exist. By the end of many matches, the shots taken would match a random distribution very well, but there are analysts who would insist they saw a strong pattern indicating a certain style of play. Like almost every piece of sports analytics, we can conclude that, while useful, it’s most effective when used in conjunction with the good old fashioned eye test of what happened. It can be used to support your argument of how the teams really played, but if you don’t take the time to properly analyse it, you could just as easily pick and choose the data to support your incorrect view.